Double knot those laces and get ready to storm the streets of downtown Chandler during Crust Chandler’s 2nd Annual Great Rustica Race on Tuesday, May 24, 2016, from 6-10 p.m. 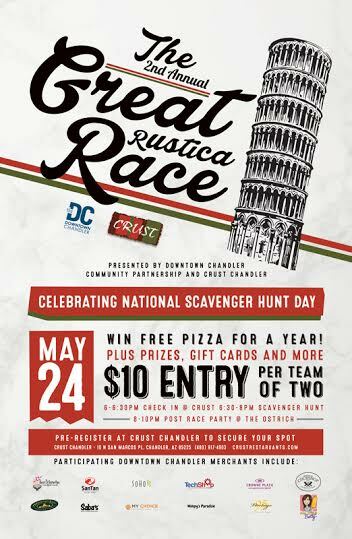 In celebration of National Scavenger Hunt Day, teams of two will embark on the Great Rustica Race, collecting scavenger hunt items at participating locations for the chance to win free pizzas for a year and gift cards galore! ← Previous Previous post: Celebrate Cinco de Mayo in Style with Baja Wine! Next → Next post: LimeLeaf, SanTan Brewing Company’s Summer Seasonal, Now Available!